The enjoyment I get trapping muskrats with footholds no doubt stems from boyhood traplines when my arsenal consisted of nothing but No. 1 longsprings. I cut my eyeteeth just before the introduction of the 110 Conibear marked a milestone in trapping history. The little bodygrip is ideal for a number of set locations, and it doesn’t just catch a muskrat, it also dispatches it swiftly and surely. Yet I still enjoy the challenge of catching them properly with traditional footholds, and a couple of seasons back, I gained trapping access to a marvelous little muskrat marsh. Talk about being a kid in a candy store again. I hadn’t done much muskrat trapping in recent years, and a marsh is the perfect place to use foothold traps. Last season, my second in the marsh, I kept myself entertained by setting a variety of footholds from No. 0 jumps up to No. 1.5 longsprings, all of it older steel from the trapping shed. The challenge when setting any of these foothold traps for muskrats is that the catch must swiftly and surely drown. W.A. Gibbs designed and in 1919 introduced his two-trigger trap specifically to address this problem. It was the forerunner of today’s stoploss trap, which has a wire “guard jaw” that comes up over a muskrat after it is caught in the regular jaws, and this prevents it twisting so much. But while such traps do have a place, they aren’t necessary in most locations. Muskrats live in and alongside water, and there is a good chance you can quickly drown a trapped muskrat in that water. There was very little in the way of trapper education back when Gibbs introduced his two-trigger trap, and I suspect many a muskrat trapper simply didn’t know how to make drowning sets with the standard traps. They fastened the trap chain high and dry somewhere on the bank. It does take thought and perhaps a little effort to make a foothold set that will reliably drown a muskrat, but not that much. If I couldn’t do it expeditiously and reliably, I would not use the traps. First things first, you need water deep enough to drown a muskrat. For me, that is up to the kneecaps, about 18 inches deep. If the water is a little shallower than that, it might be a good place for one of those stoploss traps. The guard on the jaw might keep the rat from twisting loose if it takes it a little longer to drown. But where I cannot get a trapped muskrat into water over a foot deep, I only set bodygrips and cage-type colony traps. While I like to traps muskrats with footholds, I do not abuse them to do so. My arsenal of foothold traps for muskrats includes No. 0 longsprings and jumps, No. 1 longsprings and jumps, and a few No. 1.5 longsprings. The muskrat is not a powerful animal, and the No. 0 traps will hold any that step in them. Back in the day, some big-time muskrat trappers used No. 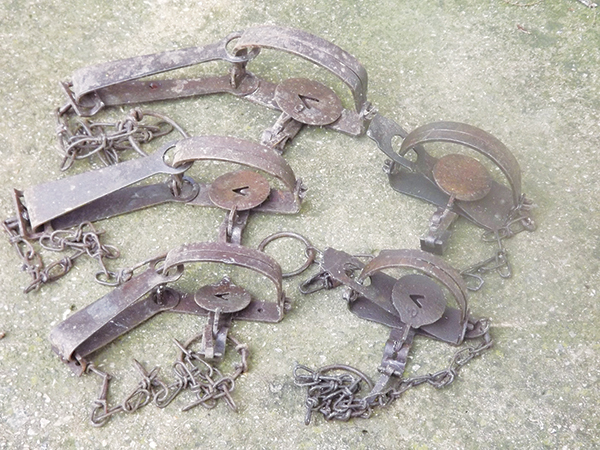 0 traps exclusively because they were small and light, and that meant they could pack more of them through a marsh. One of my No. 0 longsprings tipped the scale at 7 ounces; a No. 0 jump weighed just 6.3 ounces. While those are small traps, they do weigh enough to drown a muskrat under the right conditions. In fact, if I can set one on a log in or beside deep water, all I have to do is fasten the chain to the log. The muskrat steps in the trap, gets caught, falls off the log and drowns. Nothing could be quicker or simpler than that. If you can stake the trap in 18 inches of open water, those traps are suitable to drown a muskrat. Which brings up another consideration. In good muskrat habitat, the vegetation is often thick; it sure is in the cattail patches. And in there, even if the water is deep enough, a trapped muskrat may become tangled in the vegetation and not drown. In such locations, I may opt for a heavier No. 1.5 longspring. Oh, it has way more power and jaw spread than is really needed for a muskrat. I often catch them by both front feet in these traps, and then the traps pull the rats down quickly, even through some vegetation. However, setting these traps on feed beds can be a two-edge sword. A floating feed bed may not support that weight, and the trap might sink through before it makes a catch. My sample No. 1.5 longspring weighed 14.3 ounces, almost a pound. The lighter No. 0 traps might not be the best choice for feed beds, either. A trapped muskrat can thrash around before drowning in one of the small traps, and that can tear up a good location. You get the rat, but you can’t remake the set because the location is shot. All said and done, the old No. 1 longspring is a really good compromise here. But in every one of these locations, the fastening arrangement plays as much a part of the drowning set as does the trap. While slide-wires are often used to make drowning sets for bigger critters, and there are a few locations where I may put a muskrat trap on a slide wire, for the most part, they are not needed for muskrats. Usually, there is a simpler way, and a good trick is the use of a tangle stake. You stake the trap chain out as deep as it can go and then plant another stake deeper, beyond that. When a trapped rat swings out on the trap chain it goes around the second stake and catches the chain on it, being held where the water is deep enough to expediently drown it. I may even add a length of wire to the trap chain. With bigger animals, I’d be afraid to do this because the wire might break as the animal fought the trap. But a muskrat is going to get tangled up and drown long before it has the slightest chance of breaking trapping wire. If I find a toilet log in ankle-deep water, with deeper drowning water not adjacent but nearby, I may put a 2-foot wire extension on the chain and stake the trap 2 feet farther out away from the log. Then I drive a tangle stake 2 feet farther out than that, in water that is definitely deep enough to dependably drown a muskrat. I can move that trapped critter more than 4 feet away from the log with nothing more than a piece of wire and a tangle stake cut on the bank. Simple tricks like this cost almost nothing, and that is what makes me believe trappers in the past just didn’t know any better. Yes, it takes a little time. But when you consider that some of those old-timers reported losing half of the muskrats that stepped in their traps, capture efficiency alone makes these methods not only humane but also extremely practical. I still shake my head wondering why these methods weren’t commonplace, and the only answer I can come up with is that the trappers just didn’t known any better. My partner in that new marsh and I cut a bunch of bamboo canes to make slender 8-foot-tall stakes. We tied a pink flag on the top of each, so we could see them throughout the marsh. We made sets on the edges of the open water lagoons and tried to drive all of the stakes out in open water where the rats would not tangle in the vegetation. Hip deep is plenty enough water to drown a muskrat in a foothold trap. But as already stated, hip deep in a dense cattail marsh can be another matter. Our little trick here was adding 18 to 24 inches of wire to the end of the trap chain, with the wire attached 3 feet up from the bottom of the cane stake. As trapped rats sank they would wrap that extra wire around the cane like a barber-pole stripe, and that would hold them down deeper. My partner also brought some new No. 1.5 coils, a proven and versatile trap. But they were not easy for me to set with just my hands, not while leaning out over the front of the boat. Setting the little jump traps was hard enough. For this, the No. 1 longspring also got the nod. I could set one blindfolded wearing a pair of boxing gloves. And there’s another advantage. Sometimes it is hard to firmly bed a compact coil or jump trap on a feed bed. But the namesake long spring on the longspring trap gives it a larger footprint, and that makes it a little easier to stabilize on floating vegetation. Again, I can’t help but think back to the days when wring-out was accepted as an inevitable part of trapping muskrats. I don’t seem to be taking any extraordinary measures to drown muskrats with the same traditional foothold traps, and I’m using nothing new to do it. I can only assume the difference is that I am better educated, and I hope reading this adds to your knowledge, too. So, here I am, looking forward to catching marsh muskrats with foothold traps, same as in my schoolboy days. Maybe the little brown pelts won’t be worth much this season. But catching them with footholds will be grand outdoor entertainment for this old trapper, and I suspect more than a few schoolboy trappers might feel the same. For them, it might even be an exciting new experience.